If we truly are nearing a worldwide resource crisis, then we will all have to learn to conserve everything we use. Wasting that last little bit of anything will add up eventually. We’ve shown one (rather gross) way to be non-wasteful. This interesting tube of toothpaste is another. 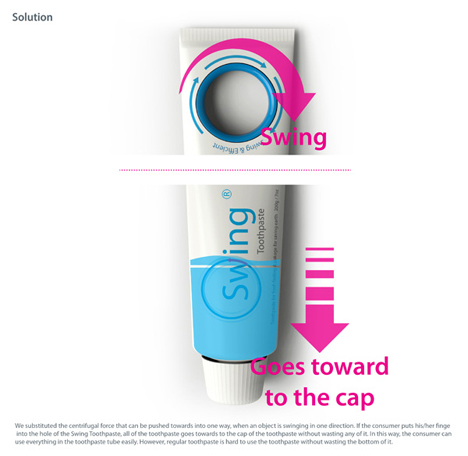 In an odd and somewhat iffy idea, the Swing Toothpaste uses inertia to make sure you get every last bit of paste onto your brush. Your finger goes through the hole in the end, where you to twirl the tube, allowing centrifugal force to push the toothpaste toward the cap. 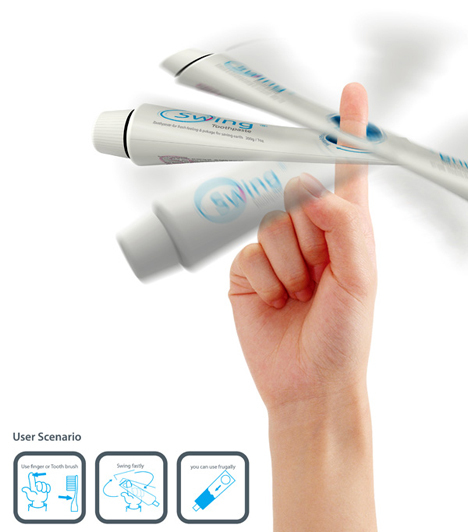 This handy design was created by Sungmin Hong, Yubin Choi, Yun Kim, Mi Jang and Seokgyu Hwang of Dankook University. It’s fun and functional, the ultimate one-two punch of design. And by cutting back on waste, you save in more ways than one. Eventually we’ll all be (forgive the pun) taking our toothpaste for a spin.